What will happen in Super Bowl LIII? ASK THE EXPERTS appears weekly from training camp through the Super Bowl with answers to a new question being posted Thursday morning. How the guest experts responded when we asked them: What will happen in Super Bowl LIII? This will shape up to be a very interesting Super Bowl. The Rams are inexperienced and the Patriots know best how to take advantage of that. It would be easy enough just to expect the Pats to roll over them since they just beat the best offense (KC) in their stadium. But – the Rams defense is the key here. The Patriots have won in the playoffs because of their run game – not Brady throwing. They rolled up 177 yards and four TDs in Kansas City. They ran for 156 yards and four TDs against the Chargers. But the Rams held the Cowboys to only 47 rushing yards (Ezekiel Elliott) and then the Saints at home only produced 50 rushing yards and no score with both Alvin Kamara and Mark Ingram. The Super Bowl could still be a win for the Pats if the Rams make mistakes. But the score should be lower and the game score closer throughout. It should be very competitive but in the end, experience likely gets those final three points to win. It’s hard for me to not see the Patriots winning this one fairly handily. New England doesn’t look susceptible in the same areas (re: coverage) that allowed the Rams to march back at New Orleans. The Patriots do, meanwhile, appear to have enhanced their offense to the point that they can win on the ground, through the air or with some balance of both. If the Rams are going to win this game I think they need to build a big lead and not put the Patriots in a situation where they are only down one score at the end of the game. We just saw what Tom Brady can do when given a final drive with two minutes left on the clock. In a scenario like this, the goat is going to find a way to win the game. The Rams need to keep their foot on the gas all game and not give the Pats a window to win it late in the fourth quarter. 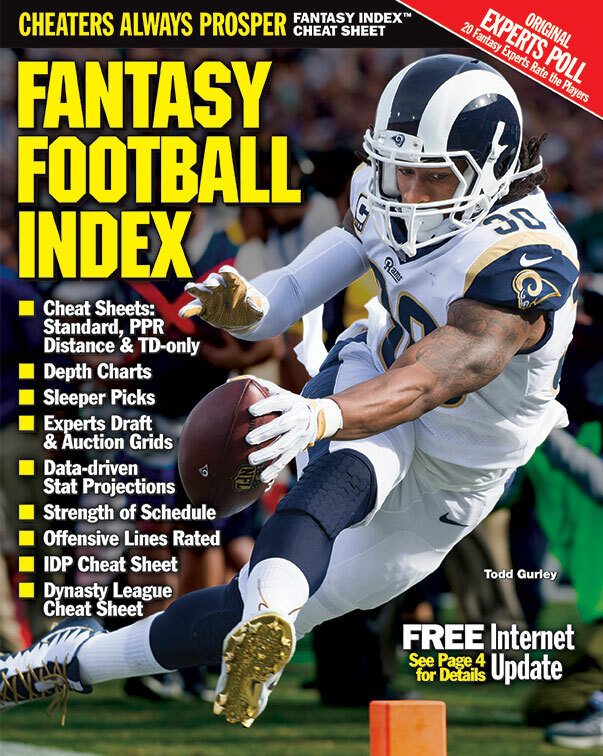 Price is a Senior Writer for Dynasty League Football. He also hosts the DLF Dynasty Podcast and the Dynasty Game Night podcast. DLF was started in 2006 to provide the first dynasty-focused website to a small niche community of dynasty players. The site continues to be one of the leading sources of analysis, rankings and projections to that same growing community. The Patriots are tough. I think they have the better defense. As well as that unit has played the last two weeks against Philip Rivers and Patrick Mahomes, I think Jared Goff is the quarterback in this game who is more likely to sputter at times. I think Brady will be more the more consistent quarterback. Nerves won’t be an issue; he’s played in a half season’s worth of Super Bowl games, and he’s dialed in right now. He’s faced good pass rushes two weeks in a row, and they haven’t been able to touch him. Patriots are favored by 2.5 points, and I think it should be a little more. I am aware that all eight of Brady’s previous Super Bowls have gone down to the final minute, but I expect New England will win this one. One perk I have enjoyed because I am older is that I have watched each and every Super Bowl over the years. Heck I even saw NFL and AFL championship games in the years before that. One common thread that links the games is that most are one-sided and boring. This time though, we are expecting a good game and it will surprise me if it is not. The Rams have a superior running attack, receiving corp and defense. On paper it looks to me like they should win. Yet I believe that logic will not apply to this game. Certainly, it can be said that Tom Brady-led Pats’ teams have lost three Super Bowls. Let us not forget though that Brady has been at the helm in more Super Bowls than any other QB, ever. Jared Goff played like a deer in headlights against the Bears defense. Playing against Tom Brady in his 10th Super Bowl, I personally believe Goff will choke once again. I look for a Patriots 38-24 win. It seems very hard in my mind to go against Bill Belichick and Tom Brady given all their playoff and Super Bowl experience and success. This will be playoff game number 40 for Tom Brady (not to mention this will be his ninth Super Bowl start) versus Jared Goff who will be making just playoff start number four (and his first Super Bowl start of course). I think New England comes out for the jugular and gets ahead while I can see Goff having some Super Bowl jitters to start the game. Ultimately I think Brady cruises to the Super Bowl win as we all re-coronate their amazing dynasty. For those looking to see some new storylines and teams in the Super Bowl, hopefully this will be enough and the final Brady Super Bowl run. The Los Angeles Rams will defeat the New England Patriots by a score of 34-31 on a last-second field goal. In a year defined by the wide-open passing game, the Patriots have found their best stride on the ground. Score one for good coaching, the jelling of an offensive line, and a multi-talented backfield. Tom Brady won't be jittery on this stage but Jared Goff, in his first appearance, might be. Patriots 26, Rams 20. Pianowski has been playing fantasy football for 20 years and writing about it for 17. He joined Yahoo! Sports in 2008 and has been blogging 24/7 on RotoArcade.com ever since. Rams start off strong and lead just before halftime, 21-3, but Brady orchestrates a brilliant end-of-half TD to make it 21-10. Then the Pats do the comeback and end up ahead by the 3rd quarter 31-24 despite going back to the run game. Fourth quarter is a walkoff as New England wins 45-27. Gronk has a good game and considers retirement. Brady has a great game and wins MVP honors. Neither will retire in 2019. Tony Romo gets kudos for his announcing and Maroon 5 are loved as halftime entertainers. Super Bowl ads are mainly lame as no one has the guts to go all-in. I expect the Patriots to win by at least a touchdown. I don't think the Rams defense is good enough to cause many problems for New England's offense, and don't think Jared Goff is good enough to trade punches in a shootout with Tom Brady. Ironically, the Rams' best chance to win, I think, is the way the Patriots were able to beat the Rams 17 years ago: play great defense, control the clock on offense, make some big plays. They're going to need to get creative and take some chances, too; if there's a prop bet for there being a fake punt or fake field goal in this game, I want in. Because that's what the Rams will need to do. I'm calling it Patriots 31, Rams 23.